Flow cytometric analysis of human peripheral blood mononuclear cells, untreated (left column) or treated (right column) with TPA #4174 (40 nM, 4 hr), Ionomycin #9995 (2 μM, 4 hr), and Brefeldin A #9972 (1 μg/mL, last 3 hr of stimulation), using IFN-γ (D3H2) XP® Rabbit mAb (Alexa Fluor® 488 Conjugate) (top row) or concentration-matched Rabbit (DA1E) mAb IgG XP® Isotype Control (Alexa Fluor® 488 Conjugate) #2975 (bottom row). Cells co-stained with #19881 CD3 (UCHT1) Mouse mAb (APC Conjugate). 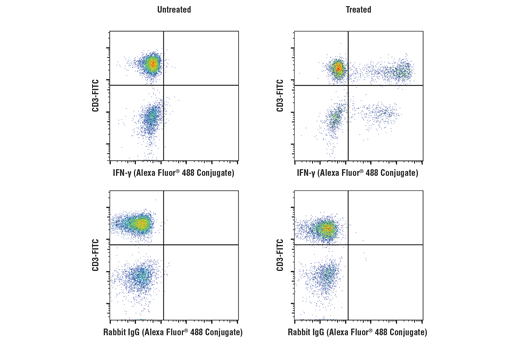 IFN-γ (D3H2) XP® Rabbit mAb (Alexa Fluor® 488 Conjugate) recognizes endogenous levels of total IFN-γ protein. Monoclonal antibody is produced by immunizing animals with recombinant human IFN-γ protein. This Cell Signaling Technology antibody is conjugated to Alexa Fluor® 488 fluorescent dye and tested in-house for direct flow cytometry analysis in human cells. This antibody is expected to exhibit the same species cross-reactivity as the unconjugated IFN-γ (D3H2) XP® Rabbit mAb #8455.